For 30 days I gave up grains, sugar, dairy, legumes and alcohol. I thought I would walk out on day 31 with a few new recipes, less cravings, and a few pounds lighter, and while all of those are true, I also gained a whole new perspective on food. I’m no longer living to eat, but instead using food as fuel for my body. This is not to say I’m don’t enjoy the food I eat and will never indulge in a treat again, I’m just making smarter choices about when and how I choose to enjoy my food! For those of you who have been following me on Whole 30, or those of you who are thinking about doing it yourself, I thought I would share the eight most important things I learned from Whole 30! While I wish there was a return policy for those calories in foods that totally aren’t worth it, unfortunately we have to live with the food decisions we make, tasty or not. If there’s one lesson I’m glad I learned, it’s which foods are actually worth the calories and which ones I really can do without. While I craved lots of things throughout the thirty days, the things I craved on the most consistent basis were lattes and chocolate. So now, when I want to treat myself, I know those are two things that I will really enjoy and that are totally worth every calorie! Another lesson that goes hand in hand with the previous one is balance. Often times, we end up eating a whole meal or even day worth of “treats” when we really only wanted one thing. If you decide to splurge on your entrée at dinner, maybe cut back on eating desert or a cocktail that night. It’s all about finding what matters to you and learning how to work those into your plan in a healthy way. Over the years coffee has become more than just a way to get my caffeine in the morning. Coffee dates with girlfriends, slow Saturday mornings with Kyle and Pecan, and even bringing a friend’s favorite to them when they need a major pick-me-up have made coffee more of an experience for me. 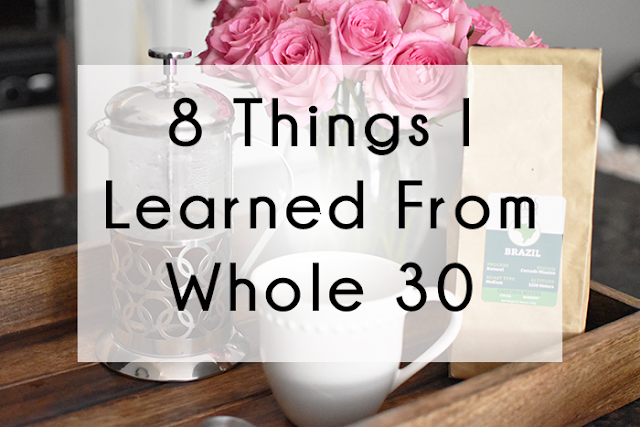 So, when I started Whole 30 I was pretty bummed that I would be giving up my lattes and half & half and drinking plain old black coffee. Nervous was an understatement for how I felt when I stepped on the scale on day 31. I had dreams the entire night before that I didn’t lose any weight and I was so, so disappointed. While I have said throughout this entire process that weight loss was not my main goal, it was and is something that was very important to achieving my overall goal of living a healthier life. During my Whole 30, I lost a total of 12.7 pounds. Don’t laugh at me for putting the .7 in there – I felt totally guilty saying 13 and worked too hard to round down to 12! Based off my reading, I do think this is a little higher than the average amount of weight lost while on Whole 30 and I think this is due to the fact that I’m active. I take anywhere from 3-4 spin classes a week and take Pecan on walks and to the park multiple times a day. Now, while all of these physical changes are wonderful, the biggest change was that I finally realized how mentally strong I can be. My willpower was pretty much nonexistent before I started. I’m kind of embarrassed to admit that, but it’s the truth. I ate things to be polite to people, overindulged while in social situations and worst of all, I ate things just because they were there. Throughout the 30 days I started to ask myself why on earth would I eat something I don’t really want? Once you start asking yourself that question you’re mentally headed in the right direction. Before Whole 30 my cravings were unreal, just ask Kyle. When I wanted something, it was all I could think about and it wasn’t long before my mood was completely affected by it. To handle the cravings, I would either give in or eat other things in an attempt to satisfy myself. I generally craved sweets or sugary things, and while I still get the urge to indulge, it happens less frequently and is way less intense than before. I learned that the easiest way to combat cravings is to eat nutritionally satisfying meals throughout the day and to do something to take your mind off the craving. For me, this was taking Pecan for a walk or tackle a chore around the apartment. Generally this gives me anywhere from 15-20 minutes to “get over” the craving and by the time I’m done I’ve completely forgotten that sweet I wanted in the first place. I’ve never really been a fan of all the detoxes out there that have you drinking just juice for extended periods of time, weird teas every morning and night, etc. Honestly, it’s not sustainable long-term, so in my mind it is a short-term solution for a long-term problem. It’s also an insult to your body, because God gave you organs like your liver and kidneys to naturally be able to detoxify the things that shouldn’t be in your body in the first place. Granted, you can stress out these organs and push them to their limit, which is what often times happens when people maintain bad habits over extended periods of time. For starters, there were literally two places that I could eat without worrying something I ate was not approved and as a result, we only sat down at 4 restaurants the entire thirty days. You would think the hardest part of eating out would be looking at what other people are eating or having to avoid the things you want on the menu, but in reality, the hardest part was finding something I could eat. I was honestly so laser focused when I would look at a menu that I didn’t even bother with the stuff I knew wasn’t approved. What I ended up ordering usually was plain meat and vegetables of some sort. I seriously considered packing sauces and oil/vinegar in my purse, but I think that would embarrass Kyle a little too much! This process also opened my eyes to how hard it is for people with food allergies to eat out. I can’t tell you how many times I went to Starbucks for an unsweetened black iced tea and they either put sugar or lemonade in it. Or we went to a restaurant, I would spend five minutes ordering my dinner only for them to add in something that I couldn’t have and have to wait for them to make it all over again. I literally felt like I had to watch them make whatever it was that I ordered. To all my friends with food allergies – bless you for not losing your minds each and every time you eat out. In the course of one day (day two), I managed to go through every emotion a human can possibly experience. The craziest part? I wasn’t even in control of it. They warn you about this in the book and say that it’s due to your body realizing you’re not longer going to supply it with sugar as fuel, but if I hadn’t read that little “sugar exorcism” part I would have thought I was absolutely losing it. I’m still amazed at how much control food has over the human mind! I promise I’m not telling you this to scare you, but to tell you that it’s just a phase and you will get through it. Another thing that surprised me was that I stopped counting how much time I had left after the first two weeks. When people would ask me what day I was on or how many days were left, I honestly had to stop and think about it. Before you start, they tell you that this is not hard and that there are many things in this world that are infinitely harder than cutting out some foods from your diet. But let me tell you, for the first two weeks, it was. I kept telling Kyle that this was so hard and all I could think about was what I was going to eat after I finished. After the first two weeks, it was like my mind totally shifted its focus. I stopped worrying about what I couldn’t have and instead started thinking about the positive impacts this was having on my life and how I could implement these long-term. While on Whole 30, our grocery bill went up significantly. There are lots of websites, articles and even entire blogs out there that are dedicated to eating healthy on a budget, and while it is possible to stick to a budget, I still think you will find yourself spending more than you were previously if you are buying “approved” foods. The meat we bought was consistently the most expensive portion of our grocery bill and buying enough for two made it that much worse. It’s enough to make a girl consider going vegetarian! I say all of this not to complain, but to be completely honest with those of you who are considering Whole 30. With that being said, I think you should consider the money you spend on groceries each week a long-term investment in your health because that is what I have started to consider it. After all, the food you eat will over time have an impact on your health! To be fair, I think I should also point out that our “eating out” budget did go down quite a bit while I was on Whole 30 which was one of the pleasant side effects! In my last post I chatted about what I planned on doing after my thirty days were up and told you I probably wouldn’t make a decision until I was completely done and that’s exactly what happened. The options that I seriously considered were going Paleo, continuing without any “cheats”, and taking one week off and then doing another round. I chose the last option and my decision was strictly based off of how amazing I feel and the weight that I lost. I’ve taken this past week off to enjoy a margs & salsa night with my bible study ladies, brunch with Kyle and a few dinners at some of our favorite local places! I didn’t want to go too crazy because that will make my second round that much harder, but it was nice to have a little less stress when it comes to eating. I will tell you that even though you crave and dream about certain foods the entire thirty days, you will feel guilty at the thought of eating them once you’re done. And if the guilt doesn’t turn you off totally, some foods that tasted heavenly before just loose their appeal altogether. I’m not saying that to discourage you from trying Whole 30 or rain on your plans to feast when you’re done, I’m saying that to tell you this does work! Have you tried Whole 30?